A gift of unprecedented generosity from alumna Roberta Buffett Elliott ’54 is expanding the College’s global view in new and creative ways. 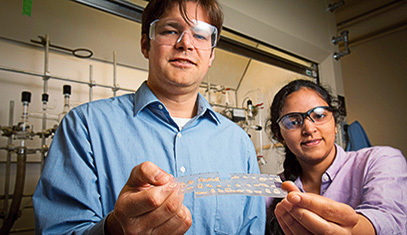 Polymer researcher Will Dichtel wants to help students see that “orgo” isn’t just a rite of passage on the path to med school — it’s essential for understanding the world. 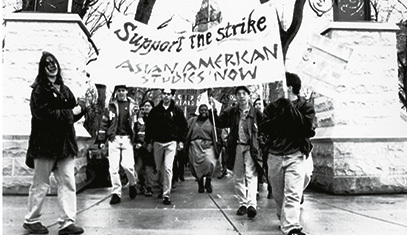 After 25 years of student activism that included protests, petitions and a headline-grabbing hunger strike, a new major in Asian American studies will debut this fall. Applause and jeers. Praise and contempt. 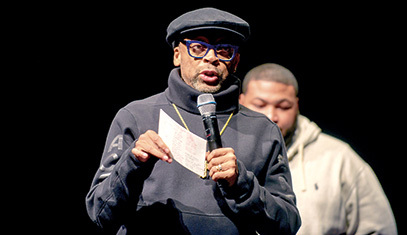 For the acclaimed and controversial filmmaker Spike Lee, it was just another day. 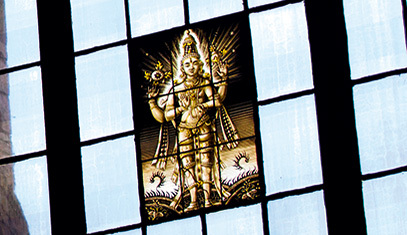 Vishnu, the Hindu god of preservation, watches over students as they seek the enlightenment of knowledge in the Martin Reading Room at Deering Library. Dean Adrian Randolph talks about the importance of a "glocal" education — one that balances an awareness of both global and local issues. "Insults" fly at Northwestern's celebration of Shakespeare's legacy. The political science major and world champion in the 10-km open-water swim went for the gold at the 2016 Olympics. A student-generated dictionary highlights Northwestern’s unique vernacular. Associate Professor Barry Wimpfheimer becomes the College’s first faculty member to offer a MOOC. Art and math? Statistics and philosophy? Weinberg magazine invited a handful of students with seemingly incongruous double majors to make the connection between their fields. The universe may be vast, but many of its secrets have been revealed by an 18.5-inch lens housed within Northwestern’s own Dearborn Observatory. Understand. Change the conversation. Take action. Weinberg College students, faculty and alumni share how they want to make an impact on the world. Richard Mesirow ’59 adds value to his community through the arts. Delida Costin ’91 brings her passion for history to law, technology and business. Christian Wistehuff ’87 became an advocate for educating Afghan women. Keep up on what's been happening at Northwestern. Readers continue to share their reflections on the tumultuous protest era at Northwestern as it was portrayed in the Weinberg magazine article “Flashback: 1970” (Spring/Summer 2015). In the midst of reading Uncle Tom’s Cabin, Luke Peterson ’19 got the blues — and then wrote the blues.